You can alter the filling and always keep your quiche crust healthy with my oil pie crust recipe. My easy quiche recipe is far from traditional. You won’t find the cooked bacon, the cream, extra eggs, and Swiss Cheese that is normally expected. But I warn you, my quiche is also delicious. The only difference is my version is cheaper and on the healthier side by cutting back on some of those ingredients, which although tasty, will kill you in time. Make it less rich using not quite as many eggs, no bacon, and including lots of veggies can help you live longer so you can enjoy more of it later in life. What I really love about making my easy quiche is that you can make it different all the time. Experiment with what’s in your kitchen. I like chopped, frozen spinach in mine, but chopped, frozen broccoli pieces work just as well. Change a vegetable or cheese if you so desire. Add a different spice to the mix. I love basil, but sage is very good in this recipe as well. Even leftover mashed potatoes or some instant potato powder can add a delicious twist to this recipe. You just need to start with my base recipe and work from there. Before you begin, you need to make my oil pie crust from the earlier post. Remember, you’re using olive oil or canola oil so it’s better health wise besides being the flakiest, foolproof crust I ever came across. Pat it down into your greased quiche pan. 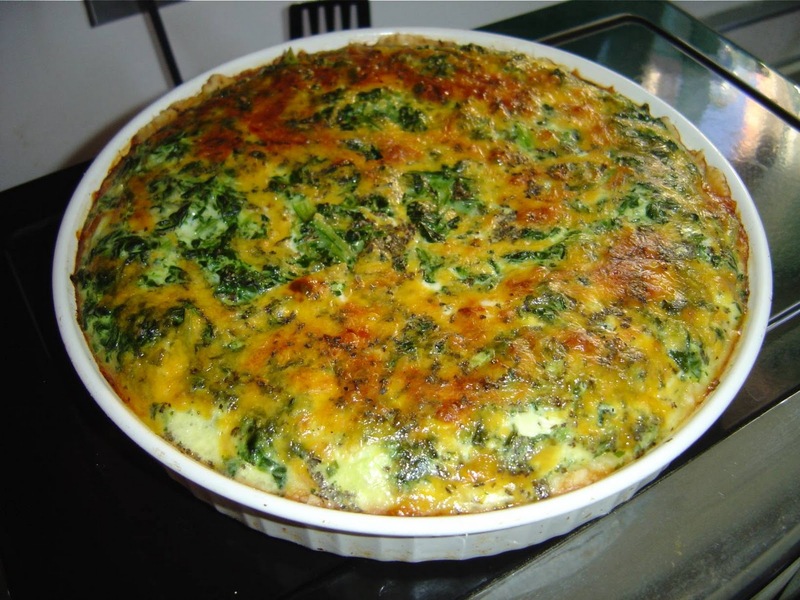 Now you are ready to add your filling to this easy quiche. Take out a big measuring cup in the four-cup size. I like to put my cracked eggs in that cup, then fill the rest with milk up to the 3 cup line, add your spices, and then whisk it until the eggs are well beaten. After you unthaw your frozen spinach, drain the excess liquid and put it in the bottom of your shell. Add your shredded cheese next. Finish up by pouring your measuring cup with the eggs, milk, and spices. Bake at 400-degrees for about 50 minutes or until a knife inserted in the center comes out clean. Previous Post Improve Your Mood Through Food! we love quiche, we usually add lots of mushrooms and sometimes go crustless! Mushrooms are so good in there too! Like I said, you can be so creative when it comes to quiche and pot pies! Thanks for writing!